Gartner shares that most consumers start their purchase for a brand by using search. Search beats e-mail and social, which makes sense. If you wanted to buy brand X, wouldn't you just go to Google and search for "X"? Of course. Which then leads us to this point: how well does your business rank for your brands? If a customer Googles brands that you sell, such as X, Y, and Z, where do you rank in Google? The Gartner articles shares that brands want to control search because A. consumers start there, and B. not controlling it leads to gray marketers and resales sites controlling the brand experience. 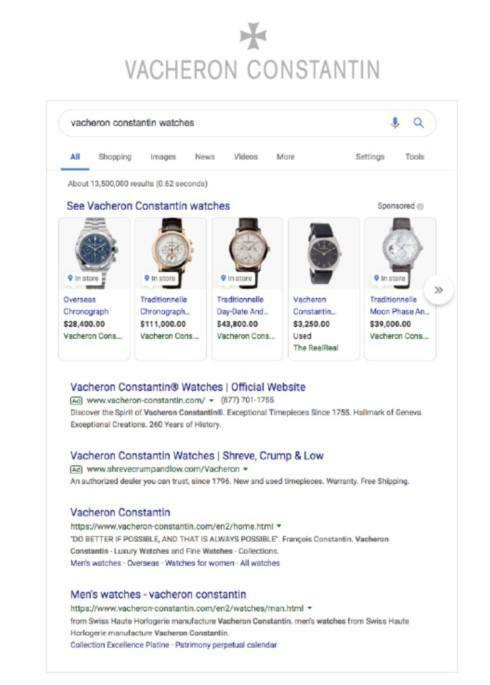 The watch brand Vacheron Constantin helps buy local ads to send shoppers to local stores. A notable fact from the Gartner article is that " only 61% of watch brands and 79% of jewelry brands" sell direct (aka offer an online checkout. Since the brands are not direct to consumer (DTC), the brands often have to rely on buying ads to direct traffic to physical stores.